Caitlin and Brandon’s Safety Harbor wedding provided a garden chic aesthetic with subtle touches of greenery and a romantic color palette of pale blue and ivory. Covered in an abundance of soft flowers and rustic wooden furniture, the Tampa Bay natives’ wedding day embodied a swoon-worthy, country ambiance. Searching for the perfect ceremony venue, the couple kept in mind the importance of a gorgeous space that would be perfect for pictures, big enough to fit their guests, and adaptable to Florida’s uncertain weather. When it came time to research reception venues and vendors, the bride turned to Marry Me Tampa Bay for inspiration and reviews. The bride and groom knew they needed certain details to pull their theme off perfectly and were delighted when they came across Tampa Bay decor rental company A Chair Affair. 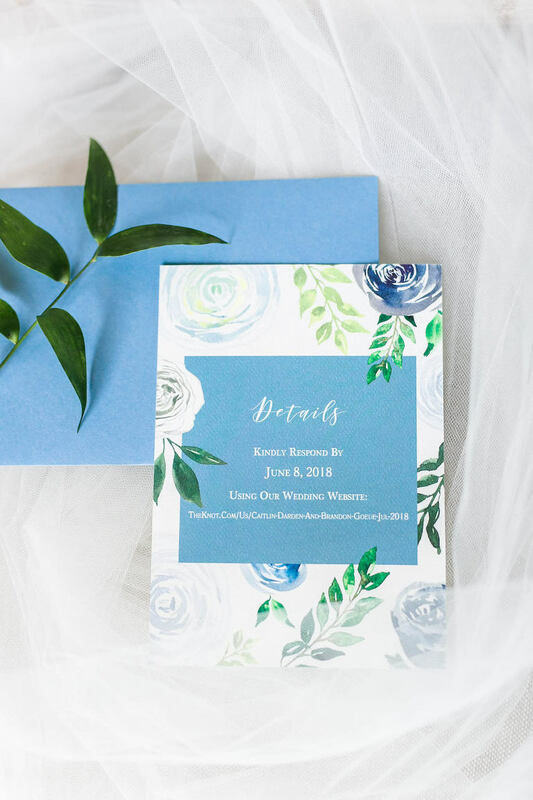 As the big day approached, the bride turned to a trusted wedding stationery designer, Sarah of Sarah Bubar Designs, to create her floral themed invites. 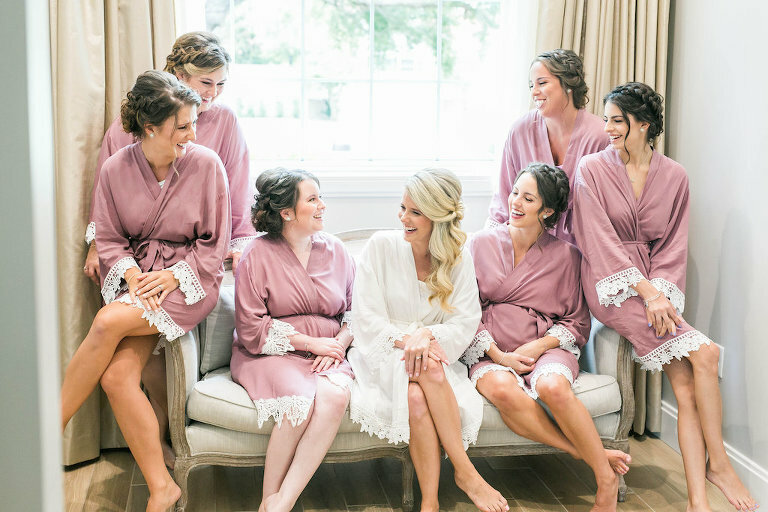 With a few ideas in mind for hair and makeup, the bride looked for a wedding hair and makeup artist who could ensure a polished look that lasted all night. Looking back on their wedding day, the bride couldn’t forget the hilarious moment her groom added some flair to the wedding ceremony. 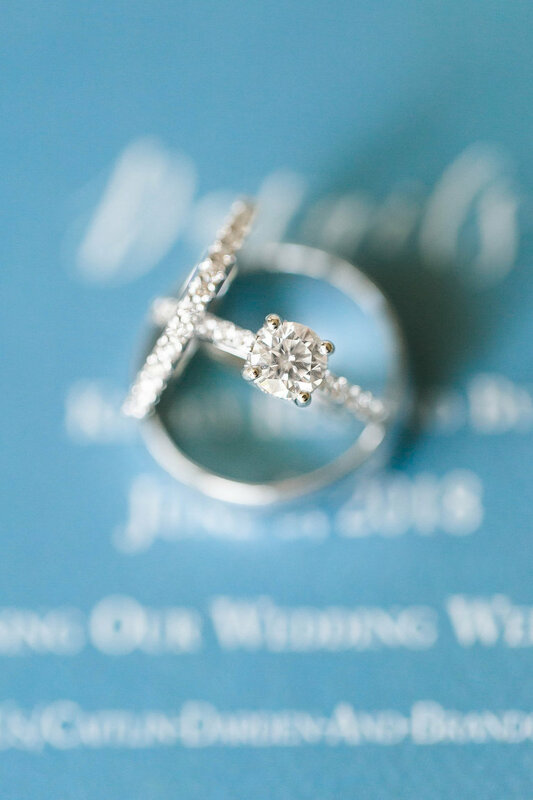 “Brandon said ‘I do’ twice, and it was hilarious! I guess the pastor paused after his sentence so Brandon immediately replied, ‘I do’ and everyone laughed. There’s actually a picture of me bent over laughing and a few photos of our guests cracking up,” the bride reminisced. What was your wedding invitation inspiration? My obsession with florals! We wanted to incorporate the colors and the flowers into our invitations, but we weren’t sure how. Sarah of Sarah Bubar Designs is a longtime friend of mine, and I have had the pleasure of supporting her and watching her business grow over the years. Her designs are incredible, and I love the watercolor and florals she uses throughout. I was so happy that my invitations were so unique to my wedding with gorgeous colors and elegant calligraphy addressing all of our matching envelopes. Everything turned out stunning! We really wanted to have a beautiful ceremony and reception space, both perfect for taking photos and adaptable to the weather. We needed space large enough for our families and guests. We were so excited to book with Harborside Chapel. In fact, our schedule kept conflicting to meet initially, so we went ahead and booked it before we even saw it in person. For us, it was everything we wanted in a venue. When you enter the chapel, it’s absolutely breathtaking! There was an open scenic outdoor area for beautiful photos, a gorgeous bridal suite for the bridal party and lighting that filled the chapel perfectly. Harborside Chapel was the perfect venue! The coordinators were so helpful in making sure they had all the timelines from my wedding planner and making sure that everything was perfect for us leading up to the big day. They emailed promptly and were always so great about answering all of our questions. Our bridal suite was stocked with snacks and cold water for the big day, which was perfect for all of us anxious girls that had been up getting ready since 7:30 in the morning. We absolutely loved it there! What were your wedding hair and makeup inspiration? I had a few ideas on Pinterest for hair; I knew I wanted my hair to be somewhat down. I wanted a company who could deliver quality and consistency. I have very thick hair, it holds a curl very well and can be done and set for the whole night, so I knew I needed to find the perfect company for hair and makeup. I chose Femme Akoi because I really liked their photos on their website and was impressed with their glowing reviews. From the beginning, they made sure my trial looked the exact same as my wedding day. They went to the same lengths so I knew exactly what I’d look like. I was really impressed with the way the owner, Christine, took my ideas and came up with her own to get me exactly what I was looking for. My curls were polished perfectly, and I got so many compliments that made me feel that much more beautiful. They did an amazing job with everyone’s hair and makeup and were very professional and lovely to have while we were getting ready. Brandon surprised me for my birthday with tickets for a cruise. I was so excited because I’d never been on a cruise before! On June 25th, the first night of the cruise, he took me to the top deck of the ship before dinner. Brandon told me he wanted to take pictures. While people took pictures of us, he asked, “Do you know what would make this cruise even better? If you’d be my fiancé.” He got down on one knee and asked me to marry him! the ceremony most definitely represented our love, the reception represented all of the amazing times we’ve had in our relationship. We also put a lot of thought into our song choices to make the night even more special. Garden, chic. I loved all of the greenery with white and blush florals with wooden accents here and there. Wedgewood blue and ivory with greenery. I actually gave Brandon the choice of colors: blush, champagne, silver/gray, or blue. He chose the blue because its unique. Neutral colors are so common. Responsibility, reasonable price, and good reviews. Our wedding planner had worked with A Chair Affair, and she trusted them. They had great prices, fantastic customer service, and great pricing! They always responded to my emails in a timely manner, and I could always reach someone by phone easily. everyone would be dancing and that definitely relies on a DJ. services! Ben was so much fun! He kept the party going all night! He even played Bad Boys to complement my husband being a police officer. Ben called Brandon and all of his friends who are officers to the dance floor to honor them. No one asked him to do that but it was so fun and so special to us. Having a wedding planner who knows the area and the vendors well is definitely important! 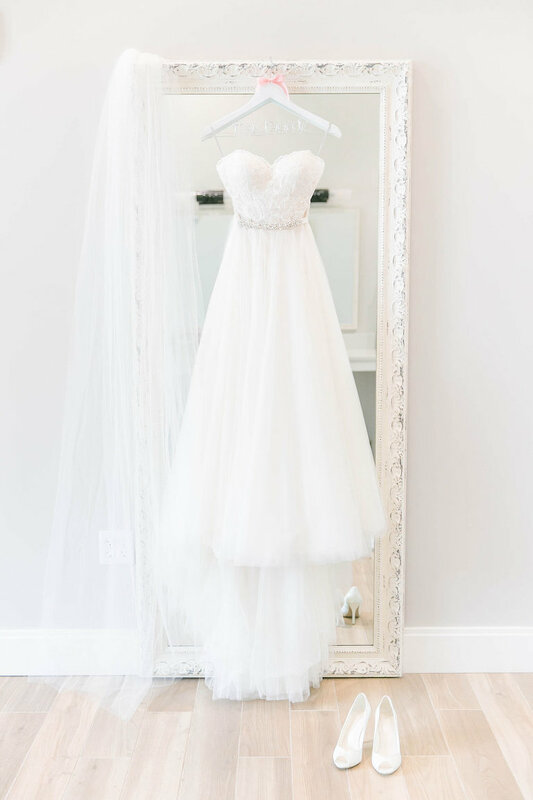 Tampa has an array of gorgeous venues, so if you have the time, visit them each to see which one best captures your vision and style you’re going for. As for the big day, enjoy the little moments with your fiancé, have fun and make it personal to you!